Glacier shares this stretch of the Rocky Mountains that runs from central Montana to southern Canada with neighboring Waterton Lake National Park just across the border in Alberta. Limited roadways, however, make travel between the two parks more difficult than their close proximity suggests. Only after our arrival did we discover that reaching Waterton from our location at Glacier’s western entrance required a nearly six hour round-trip drive (we’d have been much closer had we set up camp in the east; note for next time). Even getting around Glacier can be challenging due to a near-perpetual winter season. Going to the Sun Road, the one and only thoroughfare crossing the park, is closed nine months out of the year because of weather. Logan Pass can accumulate as much as 80 feet of snow and take work crews until late June to clear. But once opened, the drive is spectacular. In addition to sprawling mountain vistas, some of the park’s abundant wildlife occasionally makes a roadside appearance. 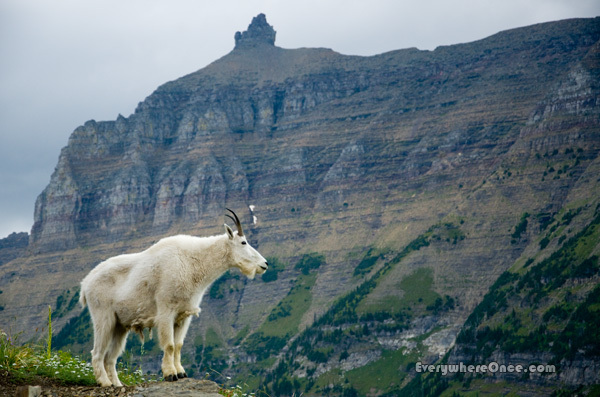 On our climb up the western slope toward the continental divide, we had the good fortune of being repeatedly greeted by a family of mountain goats, the park’s official symbol. 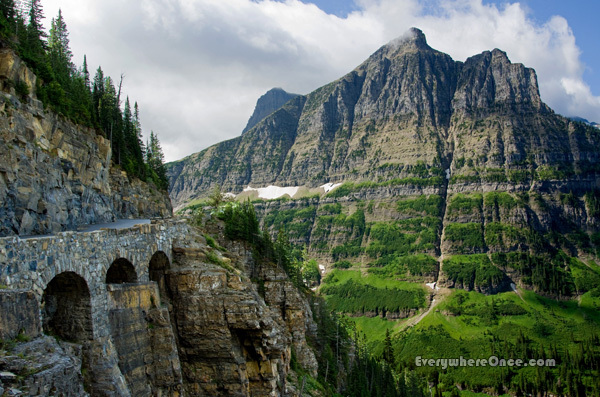 But to really experience Glacier, you need to get out of your car and on to the park’s 740 miles of hiking trails. 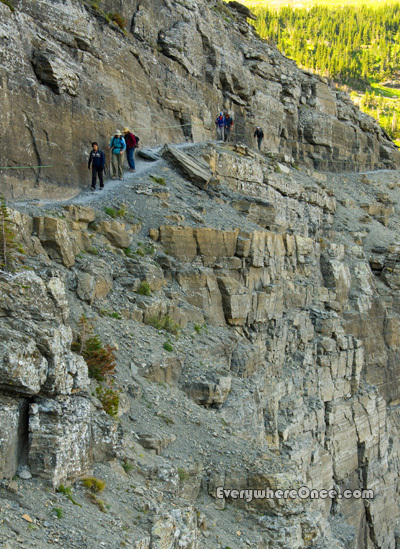 Here you’ll experience everything from a cliff hanging adventure on the Highline Trail . . .
. . . to a quiet stroll through “spooky” woods on the Trail of the Cedars. Along the same 10 mile trek to Iceberg Lake we encountered both wildflowers . . .
. . . and snow, although we were told the lake’s namesake icebergs were much smaller than usual for our visit. In fact, all of the ice is smaller than usual these days. The park once boasted 150 named glaciers. Today that number has shrunk to just 25. 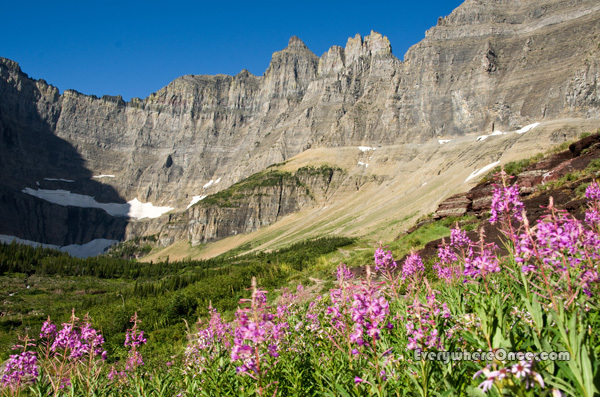 By 2020 scientists expect they’ll disappear altogether, leaving Glacier National Park glacierless. I think I need to get my hiking boots on next year and get out there! Exquisite. To be in such an environment must be overwhelming. We see the smallness of ourselves in the face of nature. Awesome. 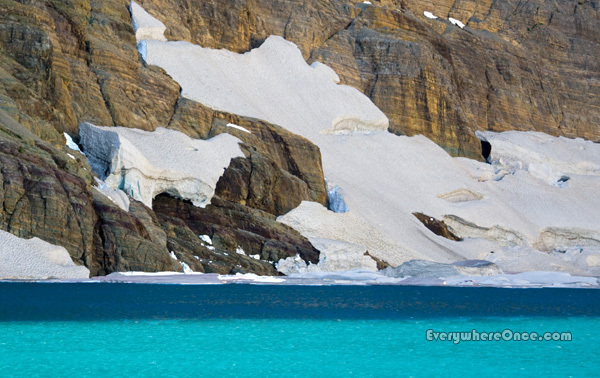 Wonderful pictures, and a sad fact that the glaciers are disappearing. Fine post. Have been to Glacier, and your descriptions are apt. Your pictures make me want to go there! Wonderful photos. I especially like the mountain goat and cedars. Beautiful work! I love these photos but how did you get that goat to pose for you? Ha! Like all wildlife photography it required speed, patience, and a heaping helping of good fortune. I just wanted to tell you how much I’m enjoying reading about all your adventures. Much respect to you both!! Good for you! Always glad to hear about people taking the plunge. Happy Travels. Beautiful pictures! I have to take my kids to Glacier NP. Glacier… definitely in the Top Three of my favorite national parks. Sad to hear the glaciers are disappearing so fast. Thanks for shout-out Pat. Always an honor. 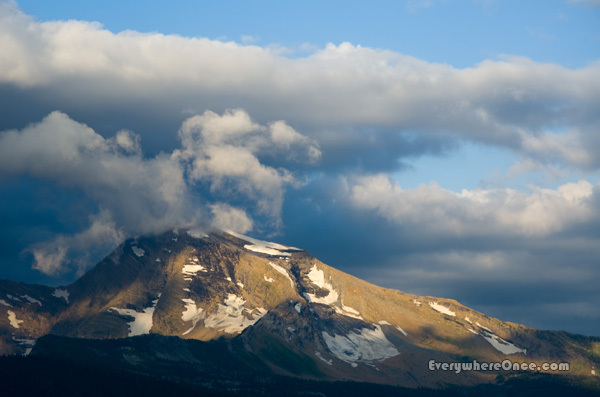 I would love to get to Glacier NP one day. The Highline Trail looks amazing. Thanks for sharing your photographs! Awe-inspiring photos! It’s sad to hear about the glaciers disappearing, and a bit scary too, thinking about climate change. Scary indeed. Mother Nature, as they say, bats last and she always bats 1,000. Best not to piss her off. Brian, thank you so much for this post. We had contemplated visiting Glacier when we were in the Canadian Rockies but we were running out of time. It was a bit too far off our path. I really enjoyed seeing it through your lens and it is on our “to do” list now. We had the same issue – contemplated getting up to the Canadian Rockies but we were running out of warm weather and it was a bit too far to go. Next time, I guess. I’m a little older than you and am wondering if my life span is long enough for all the “next times” I have accumulated. 🙂 But until “next time” I am so happy I have found so many talented bloggers. That may well be true, but how sad it would be to have plenty of life left and nothing remaining on the wish list. We can certainly dream. But unfortunately we awaken to an entire presidential election season where the issue wasn’t raised once by either side. Seems like a huge step backwards from even four years ago. Amazing! I love the goat. The mountain goats were highlights of ours too. 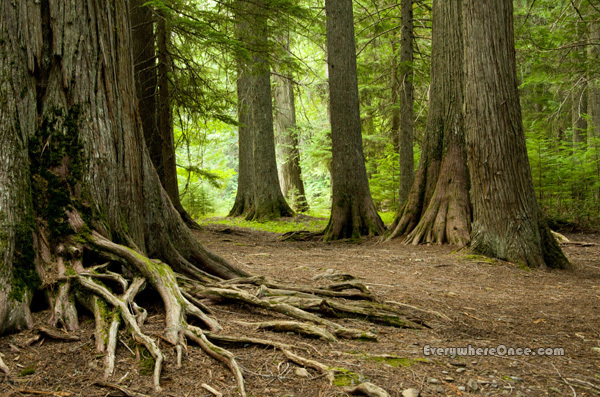 Your adventures are so overwhelmingly exciting… do you actually revisit a place or is it everywhere once? It’s mostly (but not entirely) “Everywhere Once.” I generally feel that revisiting a place is a missed opportunity to go somewhere new. A few places are evergreen, though. Paris comes to mind. We’ll be back there again and again. On our eventual trip back east we’re looking forward to hitting New Orleans and Key West again, too. But that list of places is pretty short. Absolutely agreed on the ‘missed opportunity’ part. But then again some places demand a revisit! What a beautiful place! We still haven’t managed to make it up that far… Thanks for sharing the pictures and providing a little inspiration! Thanks, as always, for following along and sharing your insights. I spent a summer working at Many Glacier Hotel. Best summer ever and GNP is my #1 favorite place. As always, stunning photos. We expect to hit Waterton/Glacier in the Fall. Coming from the East side, what is the ideal route to “see it all”? Thanks for your feedback. We are enjoying your photos a lot.